The central body of Jewish autonomy in Poland for nearly two centuries—from the middle of the sixteenth to that of the eighteenth. The great number of the Jewish population of Poland, its importance in the industrial life of the country, and the peculiarities of the political and class organization of the Polish commonwealth ("Rzeez Pospolita") were the reasons why the Jews of Poland formed a separate class enjoying liberal autonomy within the sphere of their communal and spiritual interests, the outcome of which was their exemplary communal organization. A Jewish community, with its administrative, judicial, religious, and charitable institutions, constituted a unit of self-government. The term "ḳahal" denoted both the community and the autonomous communal administration, the two concepts being identical. The administrative functions—the assessment of state and communal taxes, the supervision of charitable institutions, etc.—of the ḳahal were performed by elective ḳahal elders ("seniores" = ); while the rabbis ("doctores Judæorum") had charge of religious and judicial affairs. The pressing need of solidarity among the ḳahals and rabbis of various localities was first realized in the judicial sphere. 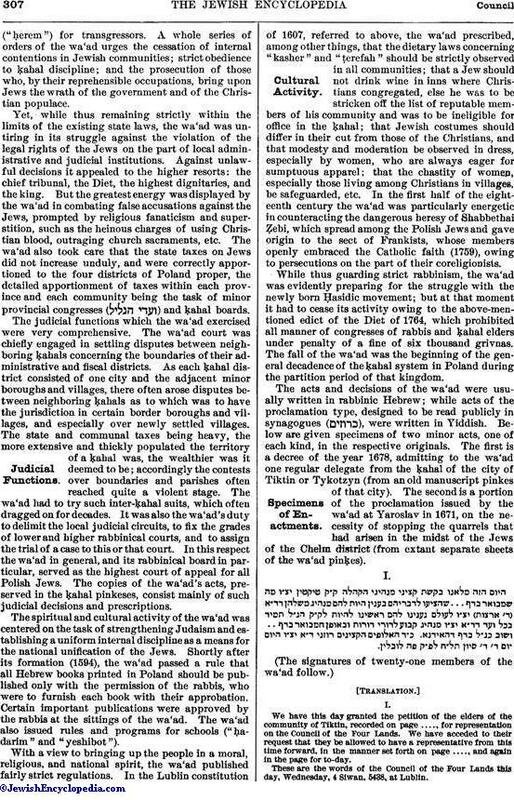 The rabbinical court was guided in its decisions by the norms of Talmudic legislation, both civil and domestic; but these norms often admitted of various interpretations; and the assistance of the great rabbinical assembly was necessary to clear up disputed points. Starting from the principle of self-government—the right to be tried by their own people only and not by strangers —the Jews were forced to create, in addition to the lower communal court, a higher court of appeals. This higher court was especially necessary whenever important litigations occurred between two ḳahals or between a private individual and a ḳahal. For such emergencies periodic rabbinical congresses, at certain points, were organized. In the first half of the sixteenth century these congresses were held during the great fairs, when considerable masses of people gathered in one place. The chief meeting-place was the fair at Lublin ( ), which city was the residence of the father of Polish rabbinism, Rabbi Sheknah (d. 1558), among whose pupils was Moses Isserles. Here, even as early as the reign of Sigismund I., the rabbis used to assemble and try civil cases "inaccordance with their own law." The king himself, in an edict of 1533, characterized one of their decisions in a private case as a decision of a supreme court for the Jews ("Russko-Yevreiski Archiv," i. No. 152). The rabbis and ḳahal elders of the various districts of Poland and Lithuania ( , Isserles, Responsa, Nos. 63, 64, 73, belonging to the period 1550-58) took part in the periodic sessions of the Lublin supreme court. It was here, too, that the rabbinical college investigated spiritual cases affecting all Polish Jews. Thus, for example, the rabbis and "rashe yeshibot" (rectors of Talmudic schools) of three countries ( )—Poland, Russia, and Lithuania—sanctioned the printing at Lublin (1559-80) of the Babylonian Talmud, with the proviso that copies of the edition be used in all the schools. This approbation ("haskamah") is printed on the title-pages of the several treatises, for general information. Here already appears the classification of the members of the Lublin congress according to the localities, three in number—namely, Poland (Great and Little, together); Lithuania, which came into closer administrative connection with the crown lands of Poland after the Lublin union of 1569; and Polish Russia; i.e., Podolia, Volhynia, and Galicia. These "fair congresses" formed the nucleus of the great central institution, which was firmly established during the last quarter of the sixteenth century under the designation "Council of Lands" ( ). The ever-widening autonomy of the Polish Jews rendered imperative the founding of an institution which might serve not only as the supreme court in judicial and spiritual cases, but also as a central deliberative and legislative body to regulate the activity of all local institutions. 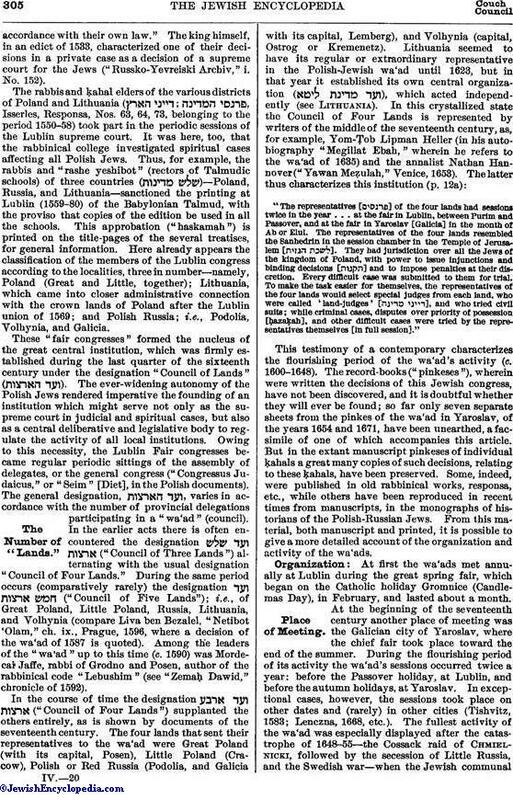 Owing to this necessity, the Lublin Fair congresses became regular periodic sittings of the assembly of delegates, or the general congress ("Congressus Judaicus," or "Seim" [Diet], in the Polish documents). The general designation, , varies in accordance with the number of provincial delegations participating in a "wa'ad" (council). In the earlier acts there is often encountered the designation ("Council of Three Lands") alternating with the usual designation "Council of Four Lands." During the same period occurs (comparatively rarely) the designation ("Council of Five Lands"); i.e., of Great Poland, Little Poland, Russia, Lithuania, and Volhynia (compare Liva ben Bezalel, "Netibot 'Olam," ch. ix., Prague, 1596, where a decision of the wa'ad of 1587 is quoted). Among the leaders of the "wa'ad" up to this time (c. 1590) was Mordecai Jaffe, rabbi of Grodno and Posen, author of the rabbinical code "Lebushim." (see "Zemaḥ Dawid," chronicle of 1592). "The representatives [ ] of the four lands had sessions twice in the year . . . at the fair in Lublin, between Purim and Passover, and at the fair in Yaroslav [Galicia] in the month of Ab or Elul. 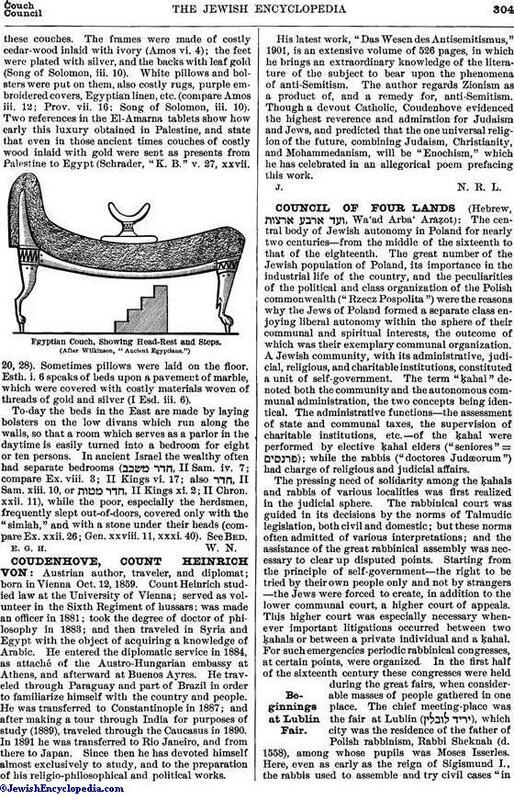 The representatives of the four lands resembled the Sanhedrin in the session chamber in the Temple of Jerusalem [ ]. They had jurisdiction over all the Jews of the kingdom of Poland, with power to issue injunctions and binding decisions [ ] and to impose penalties at their discretion. Every difficult case was submitted to them for trial. To make the task easier for themselves, the representatives of the four lands would select special judges from each land, who were called 'land-judges' [ ], and who tried civil suits; while criminal cases, disputes over priority of possession [ḥazaḳah], and other difficult cases were tried by the representatives themselves [in full session]." This testimony of a contemporary characterizes the flourishing period of the wa'ad's activity (c. 1600-1648). The record-books ("pinkeses"), wherein were written the decisions of this Jewish congress, have not been discovered, and it is doubtful whether they will ever be found; so far only seven separate sheets from the pinkes of the wa'ad in Yaroslav, of the years 1654 and 1671, have been unearthed, a facsimile of one of which accompanies this article. But in the extant manuscript pinkeses of individual ḳahals a great many copies of such decisions, relating to these ḳahals, have been preserved. Some, indeed, were published in old rabbinical works, responsa, etc., while others have been reproduced in recent times from manuscripts, in the monographs of historians of the Polish-Russian Jews. From this material, both manuscript and printed, it is possible to give a more detailed account of the organization and activity of the wa'ads. At first the wa'ads met annually at Lublin during the great spring fair, which began on the Catholic holiday Gromnice (Candlemas Day), in February, and lasted about a month. At the beginning of the seventeenth century another place of meeting was the Galician city of Yaroslav, where the chief fair took place toward the end of the summer. During the flourishing period of its activity the wa'ad's sessions occurred twice a year: before the Passover holiday, at Lublin, and before the autumn holidays, at Yaroslav. In exceptional cases, however, the sessions took place on other dates and (rarely) in other cities (Tishvitz, 1583; Lenczna, 1668, etc.). The fullest activity of the wa'ad was especially displayed after the catastrophe of 1648-55—the Cossack raid of Chmielnicki, followed by the secession of Little Russia, and the Swedish war—when the Jewish communalorganization, wrecked in many parts of Poland, needed restoration. During the second half of the seventeenth century the sessions of the wa'ad occurred once or twice a year, and more frequently at Yaroslav than at Lublin. In 1671 the wa'ad decided to meet no longer in Yaroslav proper, on the ground that it was "a dangerous and pernicious place," but to assemble at a spot ten miles distant; subsequently this decision was rescinded. The number of delegates to the wa'ad can not be exactly ascertained. Nathan Hannover, in the above-mentioned chronicle (1653), maintains that one parnas, or representative to the wa'ad, was elected from each ḳahal, and that to these ḳahal delegates were added the six leading rabbis of Poland. It appears from the ḳahal pinkeses that only the most important ḳahals of each region sent their delegates to the wa'ad. The capitals (Posen, Cracow, Lemberg, and Ostrog) of the "four lands" each sent two or even more. The signatures of fifteen to twenty-five delegates—though often the signatures of the six rabbis only—are usually found attached to the extant decisions of the wa'ads. The total number of delegates, together with the rabbis, evidently reached thirty. In the eighteenth century the operations of the wa'ad became more and more limited; its sessions took place less regularly, often at long intervals, and mostly at Yaroslav. One of the last important congresses was that held at Yaroslav in the fall of 1753. Among other matters considered was the famous dispute between the rabbis Emden and Eybeschütz over the Shabbethaian movement, resulting in the latter's acquittal on the charge of heresy. In 1764 the Polish Diet ordered Jewish general congresses to be discontinued (Vol. Legum, vii. 50); and in this way the activity of the Council of Four Lands came to an end. The subsequent partition of Poland among Russia, Austria, and Prussia, changing, as it did, the whole ḳahal system, was unfavorable to the existence of such central autonomous bodies as the wa'ads. During the two centuries of the existence of the wa'ad its activity may be divided into four branches: (1) legislative; (2) administrative; (3) judicial; and (4) spiritual and cultural. The legislative activity of the wa'ad consisted in working out definite regulations and rules for various institutions which embodied Jewish self-government in Poland, as well as in issuing prescriptions extraordinary, called for by the exigencies of the moment. Such were the decisions of the Tishvitz wa'ad, 1583, enjoining the election of ḳahal elders and rabbis in the Jewish quarter only, without any interference from the local Christian authorities. The wa'ads of 1587, 1590, 1635, and 1640 solemnly interdicted the Jews from seeking rabbinical posts in communities by bribing ḳahals or by soliciting the Polish authorities. 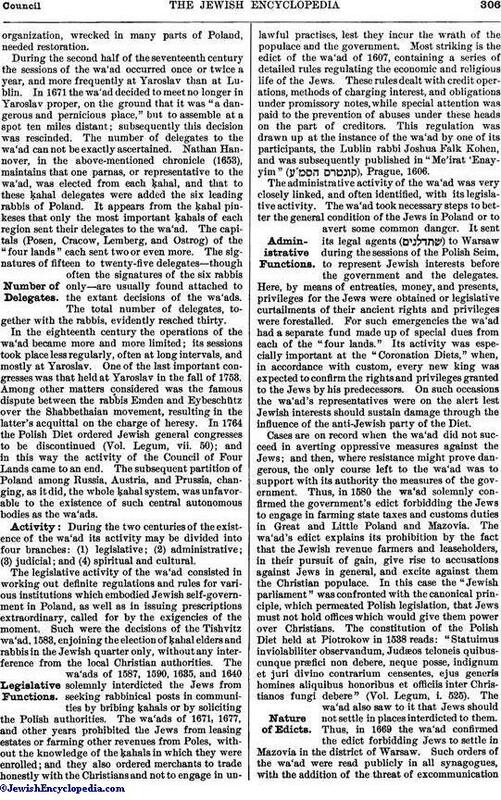 The wa'ads of 1671, 1677, and other years prohibited the Jews from leasing estates or farming other revenues from Poles, without the knowledge of the ḳahals in which they were enrolled; and they also ordered merchants to trade honestly with the Christians and not to engage in unlawful practises, lest they incur the wrath of the populace and the government. Most striking is the edict of the wa'ad of 1607, containing a series of detailed rules regulating the economic and religious life of the Jews. These rules dealt with credit operations, methods of charging interest, and obligations under promissory notes, while special attention was paid to the prevention of abuses under these heads on the part of creditors. This regulation was drawn up at the instance of the wa'ad by one of its participants, the Lublin rabbi Joshua Falk Kohen, and was subsequently published in "Me'irat 'Enayyim" ( ), Prague, 1606. The administrative activity of the wa'ad was very closely linked, and often identified, with its legislative activity. The wa'ad took necessary steps to better the general condition of the Jews in Poland or to avert some common danger. It sent its legal agents ( ) to Warsaw during the sessions of the Polish Seim, to represent Jewish interests before the government and the delegates. Here, by means of entreaties, money, and presents, privileges for the Jews were obtained or legislative curtailments of their ancient rights and privileges were forestalled. For such emergencies the wa'ad had a separate fund made up of special dues from each of the "four lands." Its activity was especially important at the "Coronation Diets," when, in accordance with custom, every new king was expected to confirm the rights and privileges granted to the Jews by his predecessors. On such occasions the wa'ad's representatives were on the alert lest Jewish interests should sustain damage through the influence of the anti-Jewish party of the Diet. Cases are on record when the wa'ad did not succeed in averting oppressive measures against the Jews; and then, where resistance might prove dangerous, the only course left to the wa'ad was to support with its authority the measures of the government. Thus, in 1580 the wa'ad solemnly confirmed the government's edict forbidding the Jews to engage in farming state taxes and customs duties in Great and Little Poland and Mazovia. The wa'ad's edict explains its prohibition by the fact that the Jewish revenue farmers and leaseholders, in their pursuit of gain, give rise to accusations against Jews in general, and excite against them the Christian populace. In this case the "Jewish parliament" was confronted with the canonical principle, which permeated Polish legislation, that Jews must not hold offices which would give them power over Christians. The constitution of the Polish Diet held at Piotrokow in 1538 reads: "Statuimus inviolabiliter observandum, Judæos teloneis quibuscunque præfici non debere, neque posse, indignum et juri divino contrarium censentes, ejus generis homines aliquibus honoribus et officiis inter Christianos fungi debere" (Vol. Legum, i. 525). The wa'ad also saw to it that Jews should not settle in places interdicted to them. Thus, in 1669 the wa'ad confirmed the edict forbidding Jews to settle in Mazovia in the district of Warsaw. Such orders of the wa'ad were read publicly in all synagogues, with the addition of the threat of excommunication("ḥerem") for transgressors. A whole series of orders of the wa'ad urges the cessation of internal contentions in Jewish communities; strict obedience to ḳahal discipline; and the prosecution of those who, by their reprehensible occupations, bring upon Jews the wrath of the government and of the Christian populace. Yet, while thus remaining strictly within the limits of the existing state laws, the wa'ad was untiring in its struggle against the violation of the legal rights of the Jews on the part of local administrative and judicial institutions. Against unlawful decisions it appealed to the higher resorts: the chief tribunal, the Diet, the highest dignitaries, and the king. But the greatest energy was displayed by the wa'ad in combating false accusations against the Jews, prompted by religious fanaticism and superstition, such as the heinous charges of using Christian blood, outraging church sacraments, etc. The wa'ad also took care that the state taxes on Jews did not increase unduly, and were correctly apportioned to the four districts of Poland proper, the detailed apportionment of taxes within each province and each community being the task of minor provincial congresses ( ) and ḳahal boards. The judicial functions which the wa'ad exercised were very comprehensive. The wa'ad court was chiefly engaged in settling disputes between neighboring ḳahals concerning the boundaries of their administrative and fiscal districts. As each ḳahal district consisted of one city and the adjacent minor boroughs and villages, there often arose disputes between neighboring ḳahals as to which was to have the jurisdiction in certain border boroughs and villages, and especially over newly settled villages. The state and communal taxes being heavy, the more extensive and thickly populated the territory of a ḳahal was, the wealthier was it deemed to be; accordingly the contests over boundaries and parishes often reached quite a violent stage. The wa'ad had to try such inter-ḳahal suits, which often dragged on for decades. It was also the wa'ad's duty to delimit the local judicial circuits, to fix the grades of lower and higher rabbinical courts, and to assign the trial of a case to this or that court. In this respect the wa'ad in general, and its rabbinical board in particular, served as the highest court of appeal for all Polish Jews. The copies of the wa'ad's acts, preserved in the ḳahal pinkeses, consist mainly of such judicial decisions and prescriptions. The spiritual and cultural activity of the wa'ad was centered on the task of strengthening Judaism and establishing a uniform internal discipline as a means for the national unification of the Jews. Shortly after its formation (1594), the wa'ad passed a rule that all Hebrew books printed in Poland should be published only with the permission of the rabbis, who were to furnish each book with their approbation. Certain important publications were approved by the rabbis at the sittings of the wa'ad. The wa'ad also issued rules and programs for schools ("ḥadarim" and "yeshibot"). With a view to bringing up the people in a moral, religious, and national spirit, the wa'ad published fairly strict regulations. In the Lublin constitution of 1607, referred to above, the wa'ad prescribed, among other things, that the dietary laws concerning "kasher" and "ṭerefah" should be strictly observed in all communities; that a Jew should not drink wine in inns where Christians congregated, else he was to be stricken off the list of reputable members of his community and was to be ineligible for office in the ḳahal; that Jewish costumes should differ in their cut from those of the Christians, and that modesty and moderation be observed in dress, especially by women, who are always eager for sumptuous apparel; that the chastity of women, especially those living among Christians in villages, be safeguarded, etc. In the first half of the eighteenth century the wa'ad was particularly energetic in counteracting the dangerous heresy of Shabbethai Ẓebi, which spread among the Polish Jews and gave origin to the sect of Frankists, whose members openly embraced the Catholic faith (1759), owing to persecutions on the part of their coreligionists. While thus guarding strict rabbinism, the wa'ad was evidently preparing for the struggle with the newly born Ḥasidic movement; but at that moment it had to cease its activity owing to the above-mentioned edict of the Diet of 1764, which prohibited all manner of congresses of rabbis and ḳahal elders under penalty of a fine of six thousand grivnas. The fall of the wa'ad was the beginning of the general decadence of the ḳahal system in Poland during the partition period of that kingdom. The acts and decisions of the wa'ad were usually written in rabbinic Hebrew; while acts of the proclamation type, designed to be read publicly in synagogues ( ), were written in Yiddish. Below are given specimens of two minor acts, one of each kind, in the respective originals. The first is a decree of the year 1678, admitting to the wa'ad one regular delegate from the ḳahal of the city of Tiktin or Tykotzyn (from an old manuscript pinkes of that city). 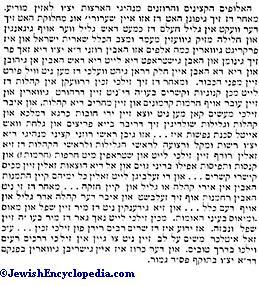 The second is a portion of the proclamation issued by the wa'ad at Yaroslav in 1671, on the necessity of stopping the quarrels that had arisen in the midst of the Jews of the Chelm district (from extant separate sheets of the wa'ad pinḳes). We have this day granted the petition of the elders of the community of Tiktin, recorded on page . . . ., for representation on the Council of the Four Lands. We have acceded to their request that they be allowed to have a representative from this time forward, in the manner set forth on page . . . ., and again in the page for to-day. These are the words of the Council of the Four Lands this day, Wednesday, 4 Siwan, 5438, at Lublin. The Council of the Four Lands report that a violent quarrel having arisen which almost ruined the whole district and—which God forbid!—might have harmed the remnant of Israel and involved the loss of thousands, the Council of the Four Lands took upon themselves the task of punishing those who initiated the quarrel or subsequently participated in it, whose names, out of respect for their position, are withheld. And since, when similar events occur in communities, and persons intrigue and violate the ancient ordinances, and ruin the communities, reports of these things arouse the government, and communities and districts are considered guilty by the nobles and priests, and there is real danger to life, . . . the Council of the Four Lands hereby fully authorize the leaders of communities and districts to prosecute persons so intriguing and offending, and to punish them with the ban, with fines, or with imprisonment . . . at the cost of the offenders. . . . Such persons should never be nominated to any office in any community or district, nor should they have the right of ḥazaḳah, . . . since they have no pity on themselves, on the community or district, or on the whole of Israel. . . . They ignore the fact that we are already humiliated and abject in the eyes of the Christians—so much so that the authorities speak contemptuously of us—and make us still more so. . . . Let every one, therefore, take care to avoid such wrong courses and to walk circumspectly. This notice has been inscribed in the pinḳes of the Four Lands. The second specimen here given is an authentic reproduction of a sheet of the pinḳes of the Council of Four Lands. The original document contains the decision (mentioned above) of the council at Yaroslav, Sept., 1671, to the effect that thereafter the sessions be held, not in Yaroslav proper, which repeatedly proved "a dangerous and pernicious place," but ten miles away, the final decision as to the location of future congresses being postponed till the ensuing Gromnice (Candlemas) congress; i.e., the spring fair at Lublin. Then follow fourteen signatures of delegates to the wa'ad, from Cracow, Posen, Lemberg, Lublin, Ladmur, Przemysl, etc. The authenticity of the signatures is made clear by the dissimilarity in the handwriting, which proves the document to be original and not a copy. It is taken from the few extant sheets of an old pinḳes of the wa'ad of the "four lands," which sheets were found in the city of Dubno, and are now in the possession of S. M. Dubnow of Odessa. the pinḳes of the ḳahal-rabbinical congresses in Lithuania during the years 1623-1761, and various other pinḳeses preserved in the archives of societies and private persons. M. Schorr, Organizacya Zydów w Polsce, Lemberg, 1899. H. R. S. M. D.